Sea Launch have made their long awaited return action on Saturday, with the launch of ATLANTIC BIRD 7 – a communications satellite. Liftoff was on schedule for the opening of a 57-minute window, at 1:18am PDT (08:18 GMT), from the Odyssey Launch Platform located in the Pacific Ocean. Spacecraft separation and acquisition were both classed as successful. The Zenit-3SL is a hybrid concept developed by RSC Energia. The two stage Zenit features a modified Russian Block DM upper stage. From its equatorial launch site at 154 degrees West Longitude, a Zenit-3SL launch vehicle inserted the 4,600 kilograms (10,141 lbs.) ATLANTIC BIRD 7 into geosynchronous transfer orbit, on its way to its final orbital location. Lifting off from the Odyssey Launch Platform, the Zenit-3SL rocket began its ascent phase of flight. The first stage of the vehicle separated 2:29 minutes after liftoff, and the protective payload fairing was jettisoned 43 seconds later. Following its six minute burn, the second stage separated from the Block DM-SL upper stage. The Block DM-SL began a 5:40 minute operation and then shut down for a 37:13 minute coast period. The Block DM-SL burned a second time for 5:51 minutes. Following this second burn, and another 9:50 minute coast period, the spacecraft separated from the upper stage over the Indian Ocean. Saturday’s launch marks a new era for Sea Launch – after they went out of business two years ago, with their previous launch – with Italy’s SICRAL 1A – occurring in April, 2009. 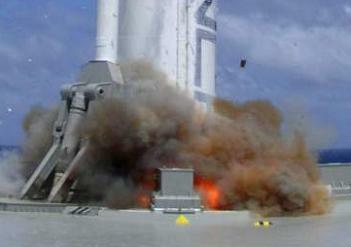 Their demise came just a year after they returned to flight in January, 2007 – following the major impact of the failed launch which occurred with the NSS-8 communications satellite for SES New Skies, after the vehicle exploded on the launch pad, destroying both the vehicle and satellite. (Over 300mb of exclusive multi-angle video and hi res photos available in L2). That initial RTF success came via the launch of the Thuraya 3 telecommunications satellite for the United Arab Emirates – a year after the NSS-8 failure. The Odyssey Launch Platform arrived at the launch site at 22:40 on September 20. The Sea Launch Commander ACS moved to relative launch support position for Payload Unit and Spacecraft testing. The Launch Platform begun ballasting operations and L-2 day operations. Built by Astrium, an EADS company, the ATLANTIC BIRD 7 will head to a final geostationary orbit will be located at 7 degrees West Longitude, a key neighbourhood for Eutelsat’s digital broadcasting markets in the Middle East and North Africa. Up to 44 Ku band transponders will be connected to a broad high power footprint serving the Middle East and North Africa for Direct-to-Home (DTH) broadcasting. A second footprint for North-West Africa, across the Maghreb countries and extending down to the Gulf of Guinea will be connected to a payload of up to 12 Ku-band transponders designed for consumer broadcasting services and equipped to meet high for internet access services. Based on the Astrium Eurostar E3000 platform, the satellite has a width – with solar panels deployed – of 33 meters. It is expected to have a service lifetime of 15 years plus. “We are delighted to be entrusted with this important launch assignment from Eutelsat,” said Kjell Karlsen, President of Sea Launch. “We have been working very hard during the past months to realign our supply chain under RSC Energia’s leadership and to provide Eutelsat with the visibility and transparency required to witness first-hand our on-schedule performance in the factories. Operators at the Hartebeesthoek ground station near Pretoria, South Africa acquired the spacecraft’s first signals from orbit shortly after spacecraft separation. All systems performed nominally throughout the launch mission. “We offer our sincere congratulations to Eutelsat, and to Astrium for this outstanding success,” said Kjell Karlsen, president of Sea Launch AG. 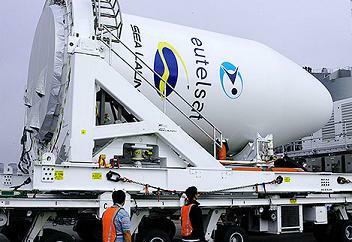 “We’re very proud to play a role in Eutelsat’s continued and expanding success. We thank you for your renewed trust and confidence in our system and our team. Michel de Rosen, Eutelsat CEO, added: “The powerful ATLANTIC BIRD 7 satellite will further consolidate Eutelsat’s resources for vibrant digital broadcasting markets across the Middle East and North Africa. Our thanks go to Sea Launch AG, Energia Logistics and RSC Energia for this precisely-executed launch and their extreme professionalism during this important campaign. (Images via Sea Launch and L2’s Sea Launch Section).